Many years ago, when my children were young, The Disney company had a slogan that shaped the values of the entire organization. That slogan was, “Be Our Guest”! There was a song written with the same title that was song by one of the Disney characters that would fill my children with excitement and glee every time they heard it. 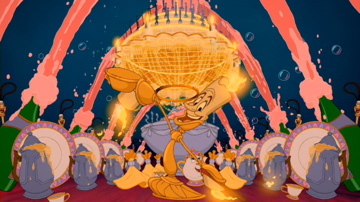 When they heard the first couple of bars of the song, “Be… Our… Guest…”, they would stop whatever they were doing and start dancing and singing. The next thing out of their mouths were, “Mommy, Daddy, can we go to Disney World?” That’s powerful marketing. This theme set the tone for every activity in their parks as well as the company at large. The Disney brand was recited and emulated in businesses throughout the world. They became a company known for the excellent way in which they treated their guests. Walking onto the Disney property, guests immediately feel secure that the proper preparations had been made to ensure that all of there expectations would be met and possibly exceeded. Branding is powerful. It drives everything. Psalm 23:1 is a passage of scripture that I have read many times and even memorized. I was taught to recite it as a child. “The Lord is my Shepherd, I shall not want…”. Many of us can quote these familiar scriptures, but I wonder if they really make for change in our lives. I recently re-read this passage in another translation. “The Lord is my Shepherd, I shall not be in want.” Upon reading that phrase, “in want”, I realized that my relationship with the Shepherd Jesus was also based on branding. Living under the Shepherds covering represents a well thought out plan by God the Father to make perfect provision for all of my longings and desires. Just like a person paying for a ticket to enter the Disney park has expectation for a time of family fun and connection; we have been purchased by Jesus’ sacrifice on the cross which grants us access into everything we need for life and godliness. When we are abiding in the Shepherd, we don’t have to be in want. “In”, is a function word used to indicate inclusion, location or position – within limits. My children were not disappointed when we vacationed at the famous theme park. They squealed with excitement when we walked through the gates and they realized that they were finally “in” Disney World. Maybe we should do a little more dancing and celebrating the fact that we are “In Christ”. Our marketing strategy of love, joy, peace etc. should make people long to be a part of the “in crowd”. I like being part of the “In crowd”. How about you? A “Free Gift” just for you!